Aqui está, como prometido, a receita das botinhas. 5ch and join in a circle. Work in spirals. We worked towards the sole, now we start working the upper part. Work 14 rows of 40 sc. Put the two parts together, working a row of sc. Thank you for sharing your pattern. These are so sweet. 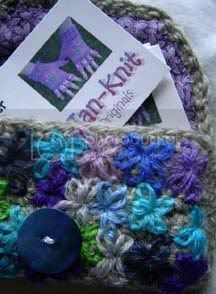 I will make some for my great niece! I hope you´ll have fun making them. These are fantastic... they took my breath away! It's so generous of you to share the pattern. I think I'll start a pair for my cousin's new baby tonight! i LOVE these slippers! i am having some trouble understanding the pattern. can you help me? i am a bit of a beginner crocheter. can you tell me in regular words what (sc*1, 2sc*1) *5=15 means? thank you so much! i appreciate you help! Hi, I have the same problem. i am a bit of a beginner crocheter. can you tell me in regular words what (sc*1, 2sc*1) *5=15 means? thank you so much! i appreciate you help! 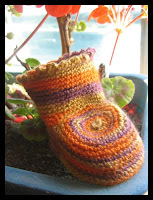 I love the look of these little booties, but I can't figure out the pattern starting at line 8.